Slower than, flowing uphill in January. That could be said of several things chez Margaret these days: spring's arrival; making up for sleep deprivation from my latest trip before my next one; my 5-year-old computer; my work. Each day is a new day and I wake up with fresh resolve, fresh blessings, fresh mercies for unfinished business from the day before, and by 4 p.m..... Ah, well! So what's been taking up my time this week? 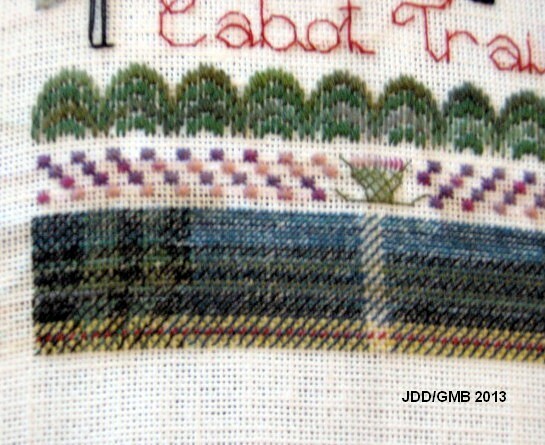 On Saturday evening I finished the tartan (Row 20) on the Atlantic Seaboard Sampler -- and I didn't go blind! That row took so long that I'm 'way behind schedule to finish the piece for early May, so I'm now hustling to do the last dozen rows. 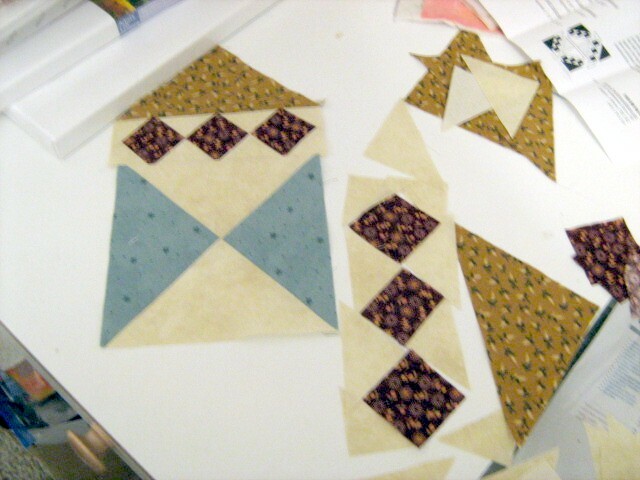 Let's just say that frogging is not the exclusive purview of knitting and piecing! Today: Row 22 -- or at least, a start! Yesterday afternoon I decided I had to get back to the sewing machine. A few months ago, in a clean-up and sort-out of my sewdio, I re-discovered a draw containing three different kits for blocks-of-the-month (BOMs) that I'd collected over three years in Calgary from the now-gone Freckle's Quilt Shoppe (Janet, the blessed owner, retired last year in ill health -- or so I'm told). I resolved to make them up over the course of the next year or two -- they're throw-sized so I can quilt them myself -- and give them away. The first BOM is called "Cinnamon", and it's full of mustard yellows, maroons and wines, deep greens and navies and browns and olives. The first two were fairly straightforward, but Block #3?! 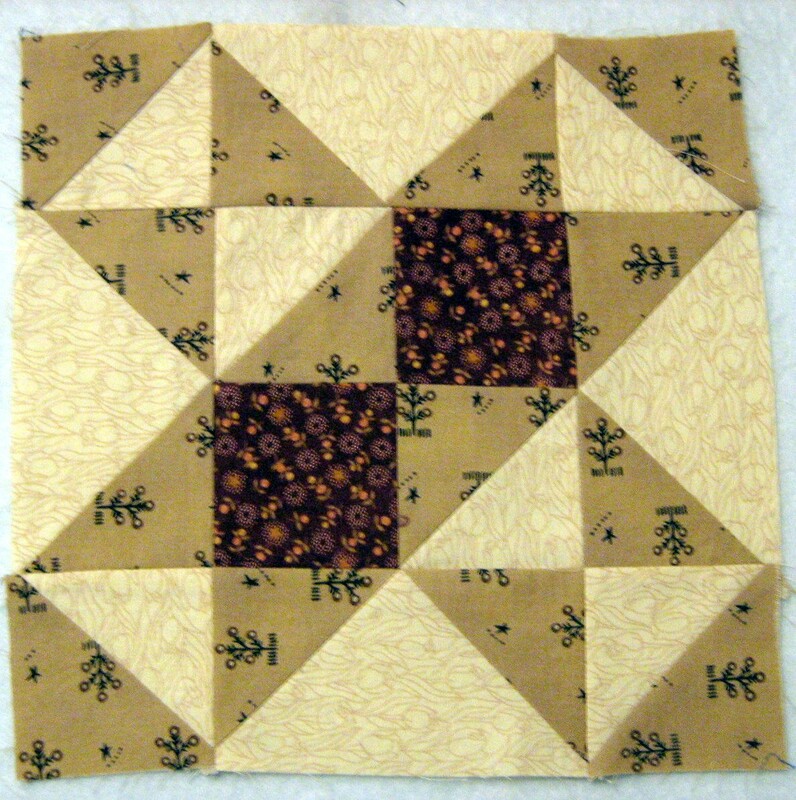 The instructions call for working with so many bias edges that I'm doubtful that it will come out the same size as the first two -- and I'm loathe to try making it a second time! 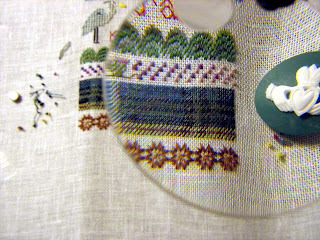 As you can see, right now it's still a Work In Progress, so I'm going to squeak in under the wire and link up with WIP Wednesday on The Needle and Thread Network. Then I'm going to finish this baby while the day is fresh, and get on to my next art piece! P.S. : Thank goodness for my knitting. At least progress there is somewhat steadier. No photo at present, but I'm 2 pattern sets from the arm-hole shaping on the Gedifra Korfu Sleeveless Turtleneck, which means I'm that much closer to finishing it, which means that after that I have only one fingerless glove to knit and then I can reward myself with a new project! Always one step at a time...and you will get there in the end. What pressures we put upon ourselves! Love the needlework! I agree that it's nice to be able to move to a different project when a break is needed. How wonderful to have three (or more) creative things to work on! Sewing, Crochet, and TV watching are mine! -- not sure if TV watching counts as creative tho! Great projects - hope that block came out all right.